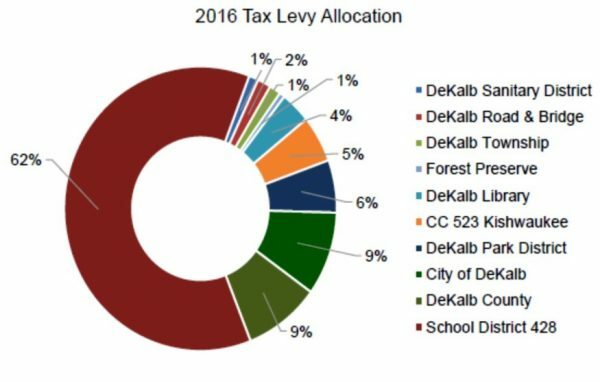 DeKalb staff are proposing a one-cent rise in the local sales tax in order to meet next fiscal year’s budget beginning January 1, 2018. They’ll tell you this is about street improvements, but they didn’t care about that last year or the year before, so I believe anything promised for streets is a sweetener to make the proposal more politically palatable. What’s really going on is that the city has run out of money for streets AND operations now. They’d like to hire three new patrol officers, but they can’t do it because of the structural budget issue, meaning they’ve hired employees beyond what the growth in revenues can accommodate. So they want $600,000 of the new sales tax to go into the General Fund. That’s how much they’re short for their current ambitions. But what the city council really should do is tell city manager Anne Marie Gaura to cut some people from the departments that come under the umbrella of administrative services. That’s where the most growth in personnel has happened on Gaura’s watch. If you haven’t heard, the DeKalb is setting a property tax “ceiling” during its regular meeting tonight. This is a legal-beagle advance notification of the highest aggregate amount that DeKalb could possibly ask for when the council sets the levy during its first meeting in December. The proportions have remained very stable for the past decade. District 428 mostly ranges within a point either way of its current share, and hasn’t risen above 63%. Kish College has gone as high as 7% and is now on the low end of its usual range. The one exception is City of DeKalb. In the chart below, what I’ve done is to compare City of DeKalb, its component unit DeKalb Public Library, and DeKalb County. 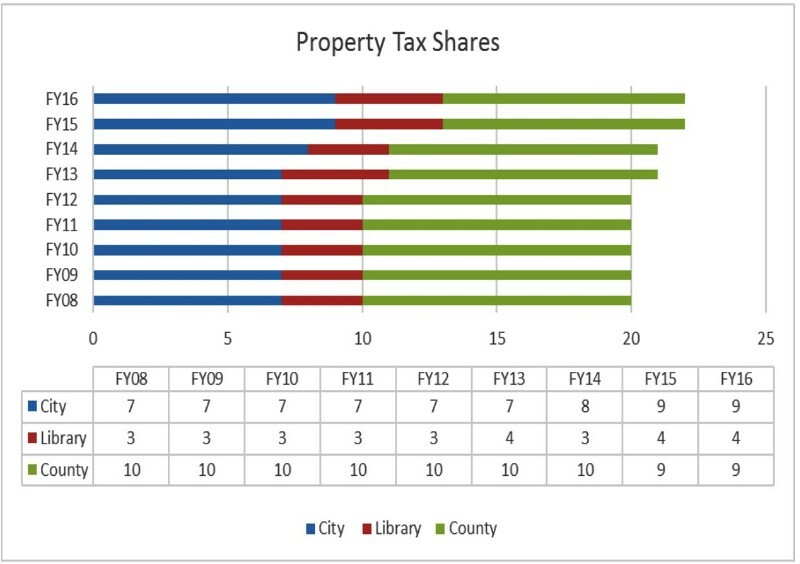 For six years (and maybe more), the property tax shares of City of DeKalb and its library equalled the share of DeKalb County government at 10%, but over the past three years the county has done a better job holding the line on tax increases, while the city has pushed rapid growth in its levies. Next year, what with the city’s new director of finance talking about a 9.5% share, the city will likely solidify its new status as second-highest consumer of property taxes in the county, even before counting the library. In FY14, there was one full-time director and one part-timer in HR. Before that, there were some difficult years where HR had only one director, and the assistant city manager helped fill the gaps (along with having budget officer duties). For FY17, we now have two expensive administrators (HR director and assistant director), a part-time administrative assistant, and a part-time HR generalist. City staff would like to make the generalist’s position full-time for the next fiscal year, which would double the personnel from FY14 and effectively triple the budget during the same time period. Even during DeKalb’s population boomlet and NIU’s peak enrollment (ca. 2007), when DeKalb was hiring rapidly to keep up with growth, HR never required more than two full-timers — and that was before all the compulsive software shopping, too. So when do we see increases in productivity? When does council end the destructive hiring spree? Until it does, we can’t have nice streets. A friend of mine asked a couple weeks ago whether there is some way to calculate how much growth there’s been of bureaucrats in city government. Like many locals, I know that the DeKalb city manager has been generally allowed to spin off new departments and hire new administrators without restraint, but we’re somewhat lacking in numbers. The main question: Just how top-heavy has the city become? My approach was to look at departments funded by the General Fund — and divisions of these departments, where applicable — with a view toward defining what makes each particular department/division primarily about administration, versus frontline public safety, versus none of the above. The details of the methodology are placed at the end of this post. Going back far enough that I could fully appreciate what Mayor Rey and Manager Gaura have wrought, I found that expenses in the General Fund (GF) have grown by $6 million since FY2013. * Roughly $4 million of it has gone to the public safety category of police and fire personnel ($2.65 and $1.33 million, respectively) and $2 million towards administrative functions in GF departments. 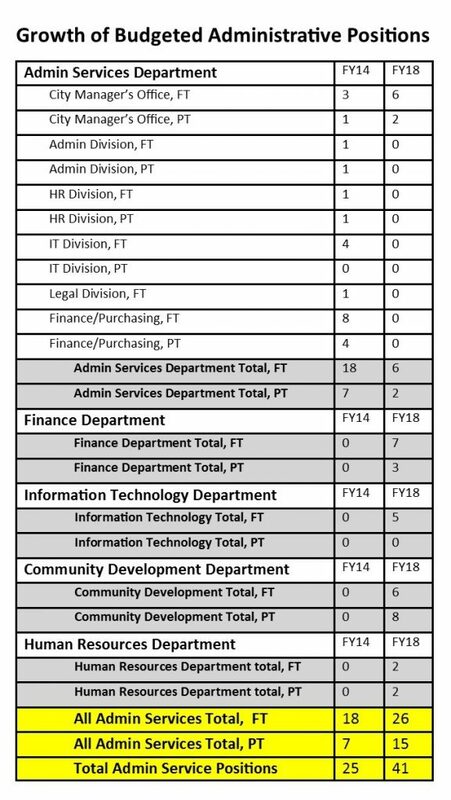 To break it down further, of the $2 million for admin, a bit more than $300,000 has gone into the administrative divisions of police and fire, and the rest of it to the city manager’s office and the creation/expansion of the HR, IT, and Community Development departments. They’re getting more in terms of GF dollars, but so is almost everybody. Are the admins actually getting a larger slice of the pie than they used to? Yes. The administrative piece from FY2011 through FY2014 averaged 21.5% of the admin-public safety total, but now its share exceeds 26%. Public Works gets no pie, particularly not its Streets Division, which has had virtually the same budget since the personnel reduction and organization of FY2011.